I was looking through my comments on this site, and I realized you were the 4th commenter on my page to welcome me into TJA haha interesting. Just dropping in. (look above for spinning lighsaber blades. When all else fails look to the Force; when the Force betrays you look to your weapons! WHEN WOULD YOU LIKE TO ENGAGE IN OUR MOST HOLY OF BATTLES? Sorry for bad English, internets forces are my ally! Я выражаю благодарность за ваши слова внедрения. Я буду видеть ваши стороне сервера скоро я надеюсь, что мы можем расчленить друг друга с нашим светящиеся палочки. I need work on my movement skills and my red and yellow stances. Blue I have given up for a lost cause. Most definitely still kicking mate. 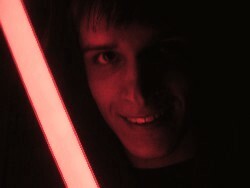 I'm good just have been practicing lightsaber duels. This comment was edited by Dark D'Kana on Jan 23 2010 10:28pm. We have considered it - the main thing stopping us is that it requires DJ Sith's time to set it up, and he's a busy man. Fortunately, we have alternatives like the IRC bot or a server browser such as HSLW which do much the same thing, so that's a fairly low priority atm. It's a good idea though and one which has been mentioned in the past, thanks. Hi I was wondering if you knew any stores where I could buy the game. So, how do you play this? Is this an actual 3D game? Or is it a Role-playing type game? What do you mean by 'Old tricks' Ner Vod Va'kion? I have several new ones...perhaps you would enjoy them?